INDIANAPOLIS -- The Patriots have seen before what happens when you don't play sixty minutes of football in Indianapolis. They saw it again on Sunday night, and though this time it didn't cost them a trip to the Super Bowl, it made their 2009 trip a lot tougher and may have had more of a cataclysmic effect on them. Leading comfortably for most of the game, by as much as 31-14 and 34-21 in the fourth quarter, the Patriot defense stopped playing in the final period, allowing the Colts to score three touchdowns en route to a 35-34 win over the Patriots at Lucas Oil Stadium. A game the Patriots had in the bag got away from them thanks to two uncharacteristic turnovers in the third quarter, poor clock and timeout management, and a decision in the fourth quarter which may have been Bill Belichick's worst as a coach since eschewing a field goal on fourth down in Super Bowl XLII. All game long, Tom Brady was carving up the depleted Colt defense, thanks to a great job of Sebastian Vollmer keeping Dwight Freeney off of Brady all game long. And all game long, the Patriots were doing a nice job of containing the Colt offense by smothering Dallas Clark, containing Reggie Wayne, and daring Peyton Manning to beat them with Pierre Garcon and a subpar running attack. For about 45 minutes, things were going the Patriots' way. Entering the fourth quarter, the Patriots were up 24-14 but should have been up 31-14 and perhaps more. The game was much closer than it should have been thanks to a third quarter which was the linchpin for the Colt comeback. The first two offensive possessions for the Patriots ended in turnovers, both occurring in the Colt end zone, and both turnovers the result of plays you don't normally see out of Brady and the Patriots. The Patriots opened the second half by driving from their own 27 to the Colt 33 thanks largely to a 15-yard run by Kevin Faulk and a 14-yard pass to Wes Welker. 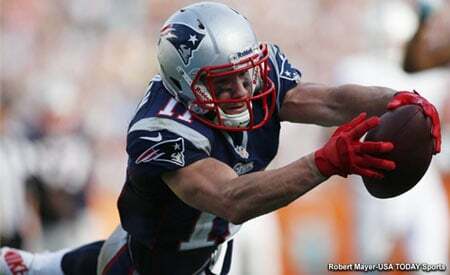 But after the Welker catch, Brady tried to get greedy by going for the home run ball into the end zone to Randy Moss. Brady threw into double coverage and Antoine Bethea leaped up and picked off the ball in the end zone and returned it to the Colt 14. The next drive should have been a backbreaker for the Colts. The Patriots held the Colts on a three-and-out, but an unsportsmanlike conduct penalty on the punt forced the Patriots to begin at their own 12. No matter, the Patriots drove 87 yards in 13 plays and chewed up 7:51 of clock. Laurence Maroney finished the drive by going into the end zone from one yard out. The problem is that he went into the end zone without the ball. Failing to secure the ball, Philip Wheeler dislodged the ball and Gary Brackett fell on the ball in the end zone for a touchback. It was only the third lost fumble of the year for the Patriots, but this one may have affected their entire season. But the Patriots, thanks to a unique defense which featured two down linemen and nickel coverage for most of the game, managed to keep Peyton Manning and his gang on ice. The Colts scored zero points off turnovers in the third quarter. The problem is that the Patriots cost themselves perhaps ten points with the two turnovers, and allowed the Colts to have a chance when the fourth quarter began. After Brady hit Moss for a five-yard touchdown on the second play of the fourth quarter, the Colts dominated the rest of the game. The defense was either too tired or simply overconfident and allowed the Colts to score a touchdown on the next possession too easily. Manning led the Colts on a 79-yard drive in only five plays, hitting Garcon for 29 yards and a touchdown on a beautiful right sideline route where he managed to outrun Leigh Bodden and Manning laid it right in there. Still up by ten, the Patriots didn't seem too concerned. The Patriots took eight plays to give the ball back to the Colts, but on the next play, Manning and Wayne got crossed up on routes and Jonathan Willhite made what should have been a game-sealing interception. The Patriots drove from the Colt 31 to the Colt 18, but could get no closer and a Stephen Gostkowski field goal from 36 yards out made it 34-21, but it was still a two-score game. And that was that. Manning led the Colts on two drives of nine combined plays to gain the one-point advantage with 19 seconds left. The first drive was aided by an interference penalty on Darius Butler which moved the Colts from the Patriot 45 to the Patriot 13. Joseph Addai bowled in from four yards out to make it 34-28 Patriots with 2:23 left. The Patriots right now were in a weak position. They were at their 20 and no timeouts left thanks to burning timeouts earlier in the half. They made it to the 28, but on third down and 2, a blitz by Robert Mathis forced an incompletion on the right sideline to Wes Welker. It brought up fourth and 2, and most everyone assumed the Patriots would punt the ball. But Belichick may have figured that his defense was too tired to stop Manning, who had one timeout and the two-minute warning at his avail. Belichick elected to try and win the game right there by going for it, and it almost worked. Brady managed to hit Faulk at the first down marker, but Faulk juggled the ball and was stopped one yard short. Belichick couldn't challenge the play because it was not yet within two minutes and reviewable from the booth and he had no timeouts left. This play will be second-guessed for the rest of the year, and despite the fact that the defense was indeed gassed, leaving Manning 29 yards away from the end zone was like slitting your own throat. As if by entitlement, Manning needed only four plays to get the winning score. 15 yards to Wayne, a 13-yard run by Addai, and two plays later, a one-yard pass to Wayne. Brady was left with 19 seconds, 80 yards and no timeouts. One play later, the game was over. The Colts now have the inside track to the Super Bowl. They win their 18th straight regular season game. The Patriots continue to do terrible on NBC other than in 2007. The Patriots had a won game and let it slip away. They get the Jets at home next weekend, they go to 9-0 New Orleans in two weeks, and they go to Miami after that. Sunday night's loss may deflate the Patriots a ton, whereas if they had held on the for the win, it would be the Patriots thinking inside track to the Super Bowl. The Patriots will have all they can to do put this one behind them. They may find themselves coming back here in January, and they have fifteen minutes of bad football in which to blame.